The Raijintek Metis Plus is the successor of to the renowned and loved Metis Mini-ITX case and, when compared to the original, comes with a variety of improvements. The pre-installed 120 mm fan now offers stylish LED lighting and a further 120 mm fan has been installed in the roof. However the dimensions of the case and the materials used both remain the same, perfect for a compact Mini-ITX case. The side window now allows an unobstructed view of the installed components. The exterior of the Metis Plus impresses with its sleek but stylish and elegant design in white with the manufacturer logo and the illuminated power button on the front. This version comes with a window cut out in the side panel, opening up a world of possibilities for equipping your case with LED lighting and other aesthetic upgrades for showing off your custom hardware. The slim cube-style case is designed for Mini-ITX motherboards and is made from 1,5 mm thick anodised aluminium and measures 19,0 cm (wide) by 24,4 cm (height without feet) by 27,7 cm (deep). The vertically-oriented motherboard is located on black painted steel wall. This innovative design from Raijintek in the shape of the Metis Plus represents a pleasant balance between the lowest possible size while still offering sufficient capacity and flexibility in terms of the choice of components that can be installed. What is new here however is the additional fan slot in the cleanly designed upper section of the case where an optional 120 mm fan can be installed. Furthermore it comes with an accessible I/O panel with two USB 3.0 ports as well as Audio In/Outs. The dual-chamber cooling design of the interior ensures that the openings on the left side panel are capable of pulling in enough fresh air. The role of exhausting the hot air falls to the pre-installed 120 mm fan on the rear behind the optionally available fan installed in the roof, as well as via the vertically mounted power supply in the front section which pulls air downwards. The Metis Plus also offers enough space to installed two 2,5" drives on the bottom and a 3,5" drive up top beneath the roof. Dual-slot graphics cards can be up to 17 cm long and powerful tower-style CPU coolers up to 16 cm in height can be installed. The full ATX power supply can be installed behind the front panel and has a maximum length of some 15 cm. This is how you pack in some serious hardware in a truly tiny form factor! The bottom of the case comes with robust feet that help to prevent vibration transfer. 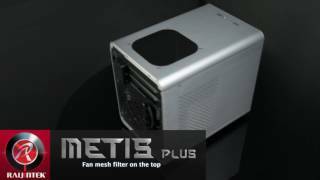 More links for "Metis Plus Aluminium Mini-ITX Case - Black Window"